I thought I'd have a rant about a recent transaction I made on eBay for hatching eggs. Rant 1 - communication, it makes such a difference. Specially as you often have to be at home to sign for the parcel, so it would be useful to know when it was dispatched and by what method. Specially for something perishable like hatching eggs. How hard is it to send a little message to say "I've sent your eggs today via whatever method and when to expect it. Hope you have a good hatch" or let them them know if there is some delay. If you have to ask, "have you sent it yet?" a day after it could have been posted and not get a reply till late that afternoon, you could be hanging around waiting for it to arrive in vain. Rant 2 - postage and packaging. I know it's not cheap to post and people often forget how much packaging costs (egg trays, tissues, bubblewrap, box, tape)... but to send it RM Standard Parcels (three to five working days). Basically up to a week to deliver. Is that 2nd or 3rd class? You must be joking, as I paid nearly £8 postage for 2 dozen eggs!!! I'm sure I'll have more to rant about when and if the eggs finally do arrive next week. I hate it when sellers try to make a profit on P&P. I charge £3 for 2 doz, first class recorded...its £2.62 (or thereabouts) for the postage, then the egg trays are 17p each, luckily i've got enough bubble wrap and bits of cardboard from stuff i've had posted to me so don't feel the need to charge for that. I've bought other stuff and looked at the charges and thought "well that seems OK" then it arrives and the postage was half the P&P cost, now i've posted a lot more parcels and have a better idea on cost it really puts me off bidding! 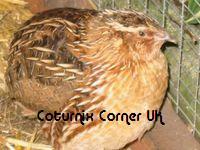 Just coturnix Emma. I wanted some unrelated fawn stock for breeding trials and I saw this listing had mixed colours with fawn in the flock. It's quite hard to find fawn. Well it arrived an hour ago to my surprise as the Royal Mail postman made a delivery I had to sign for at 7:30am. 2nd/3rd class must be delivered by another lot of posties. They came in rather unconventinal packaging; a dozen were individually bubble wrapped (took forever to unwrap) within a plastic container and the other dozen were in a polystyrene quail box. I myself have not had too many problems buying through ebay, perhaps just beginners luck? Well, I've bought rotten duck eggs once. I didn't check (float them in water) and they exploded in my incy... YUK!!! I'm with Emma on this one too, I think people are out for just what they can get. I recycle most of my packing, but buy new egg trays for about 10p each.So for two dozen eggs from me is the postage cost (£1.94) and boxes and tape (34p) total of £2.28, and if you request Recorded delivery it's 72p extra.Grand total of £3.00. When asking questions to the sellers, they blame all sorts for costs, they buy this and that. The amount of times you get eggs arriving in a box scrouged from the corner shop, stuffed with news paper and very often eggs packed in used chinese cartons with shavings. I get my cardboard boxes from the shops too, but I cut them up to fit the egg box parcels, the eggs are well packed, they don't move around in transit, and the end result is a good hatch. Sellers are not responsable for postage times, but when ever I've sent eggs 9/10 times they arrive next day. I once waited 5 days for eggs and that was a recorded deliviery too! i'm with Derek and Emma also. i re-cycle the boxes too, and pack well, i use new egg cartons, which are well padded, then bubble wrap and then i add shreaded paper to stop any movement. people who have had eggs off me get good hatch rates as a result. i think there train of thought is, "well the eggs are cheap ernough" i'll make up for it on the postage. it's about time this was stamped down on or even stamped out. me think you started a right rage here andy!!! Most of the Ebay listings I see on the USA Ebay site show a mandatory Priority Shipping. alot of the eggs I had on Ebay were setup to calculate shipping by the zip code, so the cost varied. Most sellers have a set shipping rate of $20 I have seen lately. I use shipping foam it cost me $2.60 for it, so I charge $3.